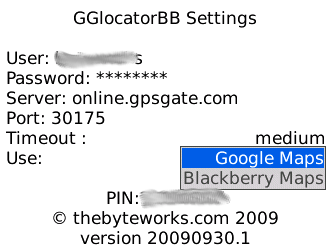 Locating utility for GPSgate for Blackberry smartphones. Shows buddies or vehicles with Google Maps or Blackberry Maps. need to restrt Google Maps. Blackberry does not show this problem. 2.6 Fill your gpsgate server address and port number. If you are using GPSGate.com service leave default. 2.7 Fill your gpsgate username and password. 2.8 Fill timeout value, small for fast networks, big for slower ones. 2.9 Fill desired target mapping applcation, Google Maps or Balckberry Maps. These must be properly installed on phone. 2.10 Select Save in menu. 3.1 "Buddies/Vehicle": info line, displays relevant informations about application status. 3.3 Buddies/Vehicles list, is populated connecting to GPSGate server and downloading latest available positions. 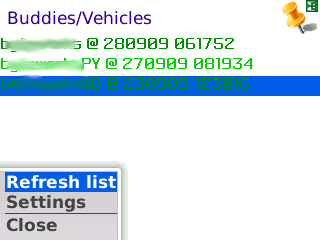 Each line shows one buddy/vehicle name and position upload date (DDMMYY) date and time (HHMMSS), in UTC values. locate selected item in mapping application. Green colored items mean last download action was successful and data is fresh. If red, last download failed. Locate selected: starts or brings in front selected mapping application, with marker corresponding to selected location.